These archives were pointed out to me by +Tony Love, over at Google+ today. I knew about the Space Gamer archive up there, but these are new to me. Now, I cannot attest to the legality of these items (and I am willing to guess that they are not legally uploaded to the site), so that means that people should probably grab what they can (and archive) before they disappear. I am sure that these archives will be of interest to other gamers and bloggers who are interested in old school stuff, and may not have been able to see these magazines the first time around. Ares was a science fiction wargame magazine published by Simulations Publications, Inc. (SPI), and then TSR, Inc., between 1980 and 1984. In addition to the articles, each issue contained a wargame, complete with a foldout stiff paper map, a set of cardboard counters, and the rules. There were a total of seventeen issues printed, plus two special issues. The SPI company published the first eleven bimonthly issues (and had prepared a twelfth) before financial difficulties led to the company being bought out by TSR in 1982. A further six issues, published quarterly, were put out by TSR and then publication of the magazine was ceased. However, the Ares legacy lived on for another couple of years; a large new section called the Ares Section was added to Dragon magazine starting with issue #84 (April 1984) and was treated as almost a magazine within a magazine. This special section provided support for science fantasy and superhero roleplaying games such as Gamma World, Marvel Super Heroes and Star Frontiers. The Ares Section ran through Dragon issue #111 (July 1986) after which it too was discontinued. The Space Gamer (TSG) started out as a digest quarterly publication of the brand new Metagaming Concepts company in 1975. Howard Thompson, the owner of Metagaming, and the first editor of the magazine, stated "The magazine had been planned for after our third or fourth game but circumstances demand we do it now" (after their first game, Stellar Conquest). Initial issues were in a plain-paper digest format. By issue 17, it had grown to a full size bimonthly magazine, printed on slick paper. When Steve Jackson departed Metagaming to found his own company, he also secured the right to publish The Space Gamer from number 27 on. In the first Steve Jackson Games (SJG) issue Howard Thompson wrote a report on Metagaming and stated "Metagaming's staff won't miss the effort. After the change in ownership Metagaming feels comfortable with the decision; it was the right thing to do." In the same issue, Steve Jackson announced, "TSG is going monthly.... from [number 28 (May 1980)] on, it'll be a monthly magazine." The magazine stayed with SJG for the next five years, during which it was at its most popular and influential. In 1983, the magazine was split into two separate bimonthly magazines published in alternating months: Space Gamer (losing the definite article with the split in Number 64), and Fantasy Gamer; the former concentrating entirely on science fiction, and the latter on fantasy. This arrangement lasted about a year. Fantasy Gamer ran six issues before being folded back into Space Gamer: "You see, we were churning out magazines - Space Gamer, Fantasy Gamer, Fire & Movement, and Autoduel Quarterly - at the rate of two a month!... We had to find some way to preserve what little sanity we had left. The best way to do this was to merge Space Gamer and Fantasy Gamer.... As it has for the past year, Space Gamer will appear bimonthly, giving us the time to get some games done, as well." Like Metagaming before it, the effort of producing a magazine became greater than its publisher was willing to bear. The change to bimonthly publication was not enough to allow SJG to focus on new games as they wished, and in 1985, it was announced, "We've sold Space Gamer. We'll still be heavily involved—but SJ Games won't be the publisher any longer. Giving up SG is definitely traumatic... but it gives us the time to do other things, especially GURPS". The magazine had been sold to Diverse Talents, Incorporated (DTI). They initially had it as a section in their own magazine The VIP of Gaming, but it soon became a separate publication again with the previous numbering and format, but with the name Space Gamer/Fantasy Gamer. Space/Fantasy Gamer PDFs are currently sold by Steve Jackson Games, through their webstore, so I will assume that these aren't legal uploads because of that. Polyhedron was a magazine targeting consumers of role-playing games, and originally the official publication of the RPGA (Role Playing Gamers Association). Publication of the Role Playing Gamers Association magazine began in the year 1981, and the target audience was players of the Dungeons & Dragons roleplaying game. Articles were written by gamers for other gamers in the style of the Dragon magazine, and information was included on RPGA membership and events. The magazine was quarterly at first and became bimonthly in 1983. For several years it was available only to RPGA members; for some, joining the RPGA essentially amounted to a subscription to Polyhedron. Polyhedron was produced by RPGA members (some of whom were professionals in the game industry) for RPGA members. In 2002, Paizo Publishing acquired publishing rights and merged the Polyhedron magazine with the sister publication Dungeon to form a single magazine (issue 90 of Dungeon and issue 149 of Polyhedron were one and the same magazine, and this dual numbering continued throughout this period). This ended the association of Polyhedron with the RPGA. It also marked a major change in the magazine's focus, from a primarily Dungeons & Dragons-oriented magazine similar to Dragon to a general d20 system magazine that often featured entirely new, simple role-playing games based on this system, along with support for non-D&D d20 games such as d20 Modern. Eventually another formerly separate magazine, the Living Greyhawk Journal, briefly became a section in Polyhedron as well. Though this version of Polyhedron had many vocal supporters, sales were poor, a situation many blamed on putting two magazines with distinct target audiences together in one somewhat higher-priced package. The Polyhedron section was removed from Dungeon as part of a major revamp of the latter magazine in 2004 and Polyhedron is no longer published in any form. Dragon is one of the two official magazines for source material for the Dungeons & Dragons role-playing game and associated products, the other being Dungeon. TSR, Inc. originally launched the monthly printed magazine in 1976 to succeed the company's earlier publication, The Strategic Review. The final printed issue was #359 in September 2007. Also of potential interest to gaming fans are the archives for Starlog (which I read off and on, back as a kid), Galaxy and OMNI. I am posting these links, but I did not upload them to the Internet Archive. If you find this stuff interesting, you might want to move quickly. I was playing around with my last.fm account and came across a way to make a list of some of the milestone scrobbles that I've made. For those who don't use last.fm, scrobbling is sort of like when the site makes a note that you've played a certain song/artist and can give you recommendation on other artists that you might like. It can be a pretty good method for finding stuff sometimes. The code that was generated was a bit ugly, but here it is. I like the fact that it generates YouTube links (for those songs that it could find on YouTube at least). A couple of these I actually still listen to now. Fifty years of Doctor Who, Who (no pun intended) would have thought that it would have lasted this long and had such a lasting impact on science fiction and entertainment. 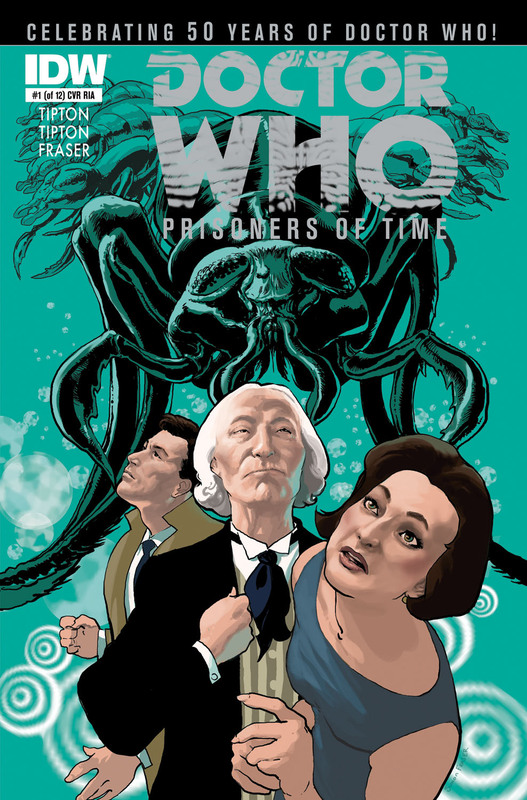 IDW Publishing is part of the celebration for this 50th Anniversary of Doctor Who with their twelve part mini-series Doctor Who: Prisoners of Time. Each incarnation of the Doctor will be featured in a story and then (hopefully) we will get the "team up" that Who fans cannot get in real life: a meeting of all eleven incarnations of the Doctor. This first issue starts at the "beginning," with the First Doctor (as played by William Hartnell from 1963-66) getting involved in an altercation with a classic Doctor Who monster. The Doctor and his companions (Barbara, Ian and Vicki...I am a bit disappointed that this story didn't feature his granddaughter Susan instead) travel back to London in 1868 to hear a lecture from Thomas Huxley. This is an excellent nod by the writers (Scott and David Tipton) to Doctor Who's start as an educational program geared towards teaching about history. In typical Doctor Who fashion, things quickly go wrong and aliens get involved. I know, reducing it down to one sentence like that makes the comic sound more cliched than it actually was to me. This was my first time reading one of IDW's current Doctor Who comics, in the past I just picked up some of the reprint collections. The Tiptons definitely know their way around a Doctor Who story, quickly immersing the story in the tropes of an early Doctor Who story. The handling of the characters is spot on. Vicki is her typically condescending self, making sure to point out how much better educated she is than the people of the time period they are visiting. Ian is square-jawed and heroic, providing the muscle needed at times in these early adventures. Barbara is, well, Barbara...and being the Doctor's general sense of empathy. The villain of this story is a direct followup to a Doctor Who serial from 1965. I would tell you the identity of the alien but I want to leave something for the readers. 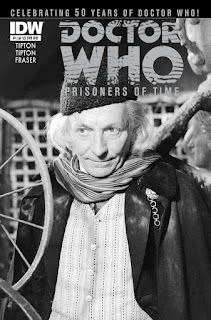 The story is fast paced, probably much faster paced than the First Doctor serials were, but that is not a bad thing. People do expect faster paced stories these days, particularly fans of the newer version of Doctor Who where the stories are in and out in a single episode, rather than the multipart serials of the classic show. Is this comic worth getting? Definitely yes. If you are a fan of Doctor Who and your exposure to the earlier incarnations of the character has been limited, this comic is a good way to learn more about the earlier incarnations of the character (so far at least). The characterizations in this story are in line with the characters that I remember from the old serials. The story is reminiscent and the aliens are taken directly from a Doctor Who serial. The portrayal of the First Doctor is spot on with my remembrances of how William Hartnell played the character. This Doctor is just as crotchety and willful as Hartnell's character was. There is an overarching story, with a shadowy villain manipulating things from behind the scenes, someone with a vendetta against the Doctor. Nothing much is revealed of the villain, but I am hoping for a classic bad "guy" like the Master, the Valeyard, or even the Rani. I am really hoping for the Valeyard, but I can understand that might be just a wee bit too obscure of a character. Time will tell. Go out and get this comic. I talked with +Tim Kirk, creator of the super-hero RPG Hearts & Souls about his game, his history as a gamer, comics and what lead him to create his game. If you don't know about Tim or his game (particularly if you are a fan of comic book super-heroics), you definitely need to check it out. Let's talk about the WaRP system from Atlas Games. For those who may not know, these are the rules, now released under the OGL, that powered Atlas' groundbreaking game Over The Edge. For me, Over The Edge was really one of the first freeform and rules light games that really clicked for me. Over The Edge came out in 1992, designed by +Jonathan Tweet and then revised by +Robin Laws. Over The Edge was a weird game, with a setting that is strange even for RPGs, and the light approach to the rules for the game really benefited that weirdness. By focusing on a stripped down approach to the system it meant that players (and game masters) could come up with strange concepts for characters (I once ran an Over The Edge game at a convention where the characters were all different media incarnations of the author Hunter S. Thompson, racing against time to solve a murder on the streets of Al Amarja, the default setting of the game) without having to worry about having to rationalize their ideas within the framework of the game's systems. It is like Hassan I Sabban's famous quote "Nothing is true, everything is permitted." Many game systems have the mindset of "If it is not covered by rules, it is not permitted." With a system like WaRP, that is turned on its head with the idea that the rules are there to help and to guide, but not to limit. That's a sensibility that was once much more prevalent in the design of RPGs that I think people have lost over the years. For some, the idea that rules have to cover every distinct possibility that could ever arise during a gaming session means that they are protected from unfairness, either from the rules themselves or by those who run the games. Sadly, no matter how explicit rules may be, or how many of them that there are in a game, ultimately they will not be able to stop someone who wants to make their fun more important than the others at the table. WaRP uses an idea of defining characters with fairly freeform, and player-defined, traits. Fans of more contemporary games like PDQ or Fate will recognize the DNA of these ideas within those games. Each character is defined by four traits, one of them a disadvantage of some sort or another. Each of these traits has a physical "sign" or tell that helps to define the character's physicality. This way, the interior life of the character informs the exterior. It is an elegant way to cover many steps in a streamlined fashion. Physical traits (like Tough, Former Soldier, Boxer, and the like) also help to define the hit points of a character. Traits can also determine if a character has special or exceptional powers and abilities (called Fringe Powers in the game). Fringe Powers can cover anything and everything from psychic abilities to magic to the powers of super-heroes to the extraordinary abilities of aliens and extradimensional beings. And WaRP does all of this in 28 pages (which includes the OGL as well). Developed for a surrealistic game of conspiracies and strangeness, this basic engine can be used to cover a lot of different sorts of games. It can be used for playing super-heroes. Author +trey causey has been using it to run online games set in his excellent Weird Adventures setting. By the way, I cannot recommend Weird Adventures highly enough if you are a fan of the heroic pulps and the fantasy literature that informed the creation of D&D. WaRP is a flexible gaming system that has a lot of juice in it. If you haven't checked it out before, I suggest doing that now and maybe checking out Over The Edge, or the supplements for the game that Atlas Games has produced over the years. If you're looking for a simple and streamlined game that's different from all of the D&D-inspired games available and yet has had a huge influence on lighter, more story-oriented styles of gaming, you really should check this game out. From The Fevered Imaginings of Rafael Chandler Comes The Teratic Tome! Looking for cool monsters for your old school games? Look no further than Evolved Grottoes & Griffons: Teratic Tome from +Rafael Chandler. This volume of new and original monsters was created for use with OSRIC, but as we all know it can easily be adapted to any old school game, with a little bit of effort. Even though Paul Cornell (of Doctor Who and a multitude of comics from both Marvel and DC Comics), has moved on from the book he created for DC Comics' New 52, the Demon Knights continues under the writing of Robert Venditti (of X-O Manowar and the indie comic Surrogates, which was made into that Bruce Willis movie that you may have seen). Demon Knights #16 kicks off a new story and a new creative team. Decades have passed since the action of Cornell's run on the book, and the Demon Knights (at least in the beginning of the issue) are no more. Once again, with Demon Knights we have a fantasy book woven into the tapestry of the new DC Universe. Familiar characters of Horsewoman, The Shining Knight and Exoristos all reappear early in the book. 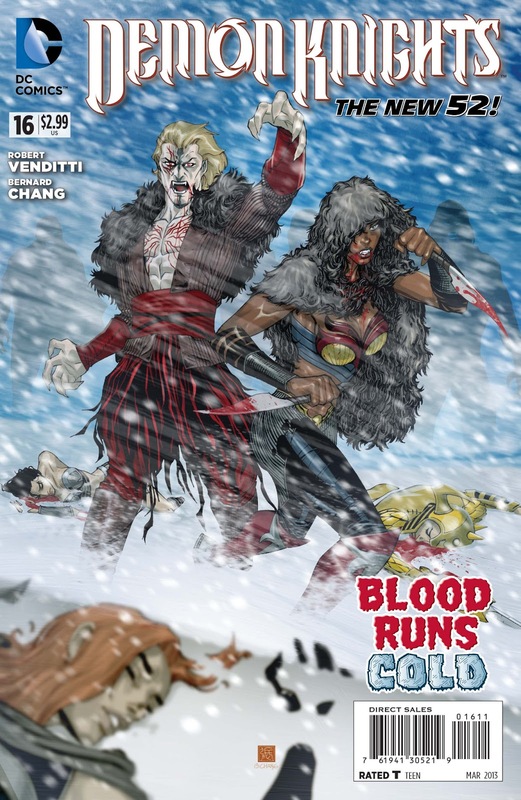 The menace of the story comes from the recently cancelled I...Vampire book, with Cain, the first vampire of the new DC Universe, crossing Europe with a growing army of vampires. They are moving across the world, searching for Themyscira (the name of the island probably best known as Wonder Woman's Paradise Island), so that he can add the Amazons to his undead army of vampires and conquer the world. Obviously the Demon Knights will have to band together again and stop him. The one flaw to doing a fantasy story in a fictional world's past, rather than in some alternate dimension like with the Amethyst stories, is that you know that the heroes stopped things because of the fact that the current world isn't being run by vampires. That does take away a bit of the drama of the story, for me at least. 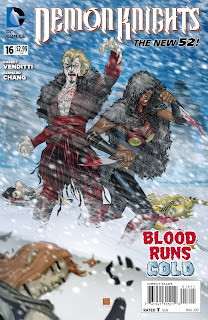 However, Venditti does an excellent job of working with the tools that he has in this comic. Cornell's initial run on Demon Knights was one of the high points of the New 52 from DC Comics for me, and Venditti does not disappoint with his follow up. He has big shoes to fill but he steps right into them with a story arc that looks to be every bit as epic as those done under the previous writing team. Bernard Chang's art is very good in this book, as well. His characters are well drawn and their faces are expressive and emotive. His action imparts a feeling of action and movement onto the page. Weirdly, when I picked up this issue I thought that Chang's cover had a certain Kevin O'Neil (of League of Extraordinary Gentlemen and Marshall Law fame) quality to it. That didn't extend to the interior art. Is this comic worth picking up? I say yes. Robert Venditti and Bernard Chang have created a compelling and engaging second act to a comic book that was one of the best of DC Comics' relaunch. It is a comic that I want to keep reading and buying. I hope, with the continued success of fantasy-oriented books from DC Comics like Demon Knights and Sword of Sorcery that we will get to see the return of further fantasy characters from the DC catalog like Travis Morgan, Warlord. As I blogged earlier today (while still asleep I might add), Wizards of the Coast and OneBookShelf/RPGNow/DriveThruRPG unleashed upon the gaming world a new site: dndclassics.com. Using a customized interface for D&D fans, WotC has begun the rollout of classic D&D materials for every edition in PDF form. These are brand new scans: with bookmarks and internal hyperlinking. Of the batch that was in the free reviewer downloads, one PDF stood out for me: Deities & Demigods for AD&D. This book was my one gamer's regret. I had a copy of the first printing (with the Cthulhu Mythos and Elric stuff), but I had to sell it during my college years to help offset the ridiculous price of textbooks. I've missed that book and it is one of the treasures of gaming, which of course means that it is horribly expensive to try to recover (if someone has a copy that they want to let go of). This just in from the people at OneBookShelf/DriveThruRPG and Wizards of the Coast. In light of the leaks and reveals of last week, I am sure that people will find this interesting. More as things develop, but it will be good to see the classics of D&D back in "print" again. More on this as it develops. I don't point to other sites and say "Download this!" very often, but a recent post made by +Erik Tenkar over at his blog made me realize that I should post about Basic Fantasy here at the blog, and talk about it more. I think part of the reason that I don't push things more is that I'm not really an OSR person, so I don't feel the need to talk about games unless it is during play. When I made my recent return to fantasy role-playing this year, one of the things that I really wanted to look for were games that were simple and streamlined. Not to knock those who like rules heavy games with a lot of crunch to them, that approach just doesn't appeal to me. Because of this, I starting looking more closely at a lot of retroclones. For my online game, I eventually ended up settling on Swords & Wizardry, but Basic Fantasy was a close second. A very close second. This game is a retroclone, in a strict sense, but the game (and the community of fan developers that have sprung up around it) doesn't shy away from "newer" ideas, like skills, classes beyond the ones from old school games and the pages of old Dragon magazines. The people take the game into the directions that they want to go, and I respect that. If there were flaws to Basic Fantasy and its community, I would say that it would probably be that there hasn't been the branching into other genres for the game (like Goblinoid Games has done with Mutant Future). It isn't like that cannot be done with Basic Fantasy, but it is interesting that it hasn't been done yet. Maybe I just haven't seen it. I will admit that I don't spend a lot of time around forums, so I could have missed something on the site's forums. What is amazing about Basic Fantasy and the fan community around it is the sheer volume of material that is available for free, in PDF and in the OpenDocument format used by LibreOffice. It has embraced open gaming and run with it. There are so many campaigns, modules and rules supplements that are available on the Basic Fantasy downloads page that you could easily run a game for years, and not have to pay for a single thing. You can buy print versions of the core rules, and some of the modules on Lulu.com, and if you like what you see on their site I really recommend throwing some monetary support their way. I've been thinking of picking up a print copy of Basic Fantasy as a birthday gift for myself. I really should get around to doing that. Sort of like with my post about Warrior & Wizard, this is one of those retroclones that sort of slips through the cracks in discussions about these things. With Basic Fantasy, I think a lot of that is because the creator doesn't have all of his stuff up on RPGNow/DriveThruRPG, like some of the other retroclone/OSR publishers. I like the attitude of doing it themselves, it hits that DIY mentality that I like so much, but I thought that it would be nice to also give them a little bit of a mention outside of their circles. If you want a well-done free RPG that is every bit as good as any of the other OSR/retroclone stuff being sold (or offered for free) out there, and you haven't checked out the +Basic Fantasy Role-Playing Game, you really should check it out now. You're missing out. I don't think that +Steve Kenson requires much of an introduction from me, not to fan of role-playing games at least. He is personally responsible for two popular super-hero role-playing games (Mutants & Masterminds and Icons), as well as having designed supplements for Shadowrun, GURPS, d20 and other systems. He's also written novels and blogs. He is a one man RPG industry. Kidding aside, Steve is a really nice guy, very engaging to speak with, and probably one of the friendlier people that I know in the gaming business. He has recently, in addition to his work with Green Ronin, reclaimed the rights to streamlined and almost old school super-hero RPG Icons and entered into the realms of being a publisher. His first Kickstarter for his first self-published Icons supplement. I managed to convince Steve to take some time out of his busy schedule to speak with me on the Dorkland! Roundtable, and although YouTube did try to eat the resulting video...it has survived for you to watch it now. I hope that you enjoy. Also, don't forget to compliment Steve on his "dress" hoodie. 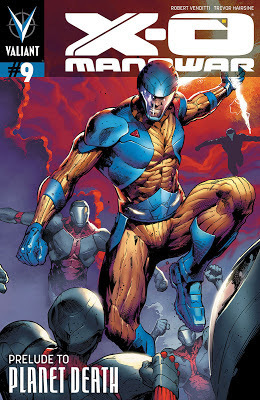 X-O Manowar #9 brings to a head the plots that have been building in the previous issues. The Planet Death story arc is about The Vine (the aliens from which Aric took the X-O armor and escaped from their captivity) overtly coming to Earth to regain their armor. The art in this issue from Trevor Hairsine is nothing less than brilliant. It reminds the reader of the Barry Windsor-Smith art of the original series, while making it his own at the same time. I have to admit that this is my first exposure to Hairsine's art. I read the first couple of issues of X-O Manowar and then let it slide off of my radar. From this issue, this was a mistake. It's hard to believe some days, but I've been doing this for 10 years, almost. I made my first post on this blog in September of 2003. It is pretty amazing how much blogs and blogging has changed since I started out. I am hopping to be able to hit some of the big conventions this year, to celebrate this anniversary. I would love for this to be the year that I am finally able to go to San Diego Comic Con, but I will probably have to settle for GenCon again. Hopefully, at least, if the finances come together on it. In the fall, around the time of the actual anniversary I am going to have a big giveaway to readers. I already have some role-playing publishers promising prize support for the giveaways, but hopefully some others will roll in as well. Let's move into the next 10 years of the Dorkland! blog. Last week I spoke with +Corvus Elrod on the Dorkland! Roundtable. It was an interesting talk and, as always, a valuable insight into the workings of the mind of a game designer. We talked about his influences, how being a computer game and tabletop designer can influence each other, as well as his crowdfunded game Bhaloidam. Check Bhaloidam out at the link, because Corvus gives it out for free in PDF form at the link. There are some interesting innovative bits to the game, around the character sheet and how players interact with it to play the game. We talk about it a little bit in the Roundtable, so check it out. I'm also using a new feature of Blogger that lets me + a person by their G+ account in a blog post. For them, that lets them know that I am talking about them. For you, as the reader that gives you an easy way to track these people down and find them over on G+. If you are a gamer and you aren't yet on G+, you really should be. Some of the best gaming (and general geeky) conversations that I have had online in a very long time are happening on Google Plus. I didn't think it was possible, but it is. If you haven't circled me over there you you can find me at +Christopher Helton. If you add me over there, please let me know who you are and why you are adding me. It will make things simpler. Brian Wood likes his near future stories, a reflection of today with just enough distance to almost make the stories allegorical. From comics like DMZ to The Massive to Channel Zero, Wood has become one of the few voices for political and social issues that has been around in mainstream comics. With Channel Zero and DMZ growing out of his post 9/11 experiences in New York City, a bit of Wood's psyche gets woven into the stories that he tells. Ming Doyle is a relative newcomer to comics, but her art has been featured in anthologies such as Comic Book Tattoo, Womanthology: Heroic, volume two of Popgun and many other places in both bigger and smaller comic companies. Doyle's aesthetic as an artist is similar to that of Wood's, who unfortunately does not do as much are or design of books as he has in the past, which gives a synergy to this collaboration. Another newcomer, Jordie Bellaire, contributes a restrained palette of colors, fleshing out the world visualized by Doyle in her job as the book's colorist. Colorists in comics do not get the attention that they deserve, but it is their work that helps bring the world in the pages to life, making just as important of a final contribution as the artists themselves. On a slightly political note, it is nice to see a comic where two-thirds of the creative team is female. With the subject matter of this book, I honestly think that helps. Mara Prince, the title character, is a super-star athlete in a future athletes are super celebrities. At seventeen, she is the foremost star of volleyball around the world with endorsements and payouts unimaginable probably to current athletes. She lives in an exclusive home unobtainable by most people in the world (even by her teammates), far, far above the hassles and problems of the rest of the people in her world. This is not without drawbacks, because she also suffers from isolation from the world that watches and idolizes her. However, it is slowly revealed in this first issue that there is a secret, other than her celebrity that also isolates her from the world, and is at the root of her capabilities as an athlete. I won't give it away, but the reveal in the final pages casts an entirely different light on the character and the story. There is a morality at play, but it isn't apparent until the last few pages. I won't give the reveal away for those who haven't read the book yet, but I can say that it casts the story into a "What would you do to be the best at what you are? Would you even lie?" direction. The issue pulled me through the story, and when I got to the ending I had to go back and read the entire comic again a couple of times to see if that ending was as blindsiding as it was at first, and then I picked up the little clues leading up to the reveal. This is a remarkably subtle story. In ten years, this will be one of the comics that we all look back at and point at as a demonstration of how comics can be more than protracted fist fights with interjections of emo "character development." 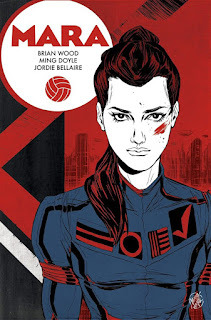 Brian Wood and Ming Doyle give us a sophisticated story that is very literate. I know that I am looking forward to the next issue. I want to see how the big reveal impacts those close to Mara, as well as the world as a whole. It's just that big. Should you buy this comic? I give this my first unreserved recommendation of "HELL YES" for 2013. If you like comics that are more than just super-heroes. If you want literate, thought-provoking storytelling in the graphic medium. If you just want a damn good comic, Mara is the comic for you. Now I will start to impatiently wait for the next issue to come out.